We put our trust in someone else’s calculations and measurements all the time. It’s just part of the modern world. Cross a bridge, drive a car, use anything electrical, and we implicity trust that the people who designed it, built it, installed it and tested it have done their job correctly. Occasionally things go wrong and disaster strikes, but, by and large, the things we make use of in our lives work properly. That said, do you fancy trusting the people who designed and installed the ladder up the Gloucester Tree, at Pemberton? 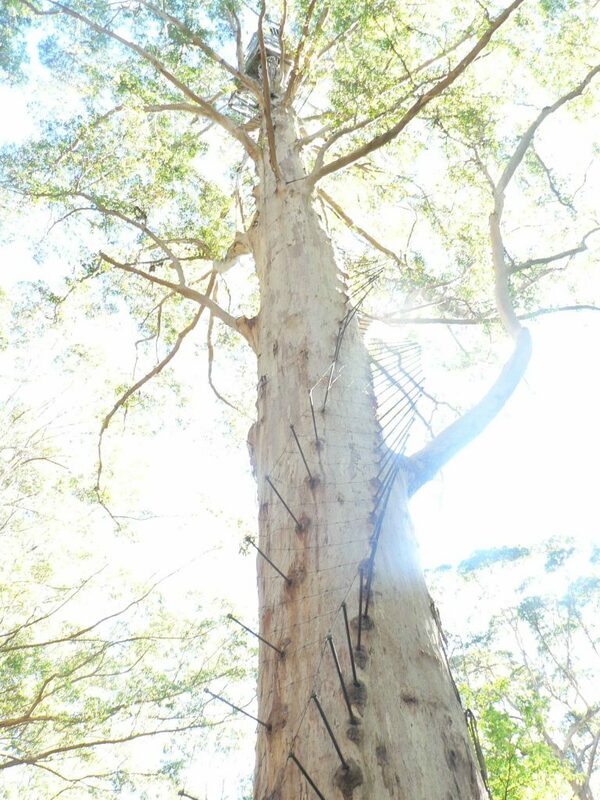 This was originally built as a fire lookout, amongst the majestic Karri trees of south-west Western Australia. But now it’s a tourist attraction. People come to climb it, or to watch people climb it (as we did). I was happy to go up to about rung four, but that doesn’t really count. Now, there must be some trees in Waikato that could benefit from such an addition. And to do so would require a bit of physics and engineering calculation and implementation. I reckon it would be a fantastic project for a student to tackle – pick the right material (please don’t poison the tree or choose anything that won’t cope with the weather), work out the loading profile, worst case scenarios (e.g. what happens when two large people cross – one going up and one going down), tackle the safety and ethical issues, and so on. And then, to get a grade A+, the student concerned has to be the first to climb to the top! You are right that it is a good engineering project, but the savior is the innate conservatism called factor of safety – both in calculations and natural design. Note all the outside edges of the rungs have a tight wire connecting them to the one above. That is spreading the load. People generally would also climb this with their bodies close to the trunk so that would put most of the load on the anchors in the tree trunk. The rungs slope downwards, and there is an outer wire cage that people wouldn’t want to tangle with, encouraging this . Thirdly, the type of people who would try to climb this would be fit and agile, aka light. It looks spectacular and would be a great design and construction project, but it is a lot safer than it looks. Having climbed this elegant structure in slight drizzle, I can attest that it feels incredibly sound! The mesh to the side looks like it could do very little and you could easily slip through the gaps between the rungs because of the angle. Apart from that, you mostly feel pretty safe and the angle makes it much easier — though it’s still quite a workout. I’m sure the thing is perfectly sound, for the reasons noted. Plus it’s been around for decades, which suggests it was built well in the first place. I note that the Pemberton Visitor’s website remarks that no-one has ever died climbing the three trees fitted-out this way (though there have been two heart attacks). That doesn’t stop it looking utterly terrifying!